Frank YangThough I’m probably a bit late to the Caitlin Rose party, her 2010 full-length debut Own Side Now having completely flown under my radar, I’m thankful that I was able to get it into my ears earlier this year before her follow-up The Stand-In came out because it gave me a reference point to appreciate just how good The Stand-In is. Which is not to say that there’s anything wrong with Own Side Now at all – it’s a charming slice of old school country that frames Rose as something of a wide-eyed ingenue, a character well-suited to her sweet, clear vocals – it just felt a touch more demure than it necessarily needed to be. The Stand-In doesn’t trade in the back porch for a roadhouse, mind you, but it’s more electrified, dynamic, and bristling with bona fide pop hooks that don’t compromise Rose’s natural rootsiness, just gives it a swagger that looks and sounds great on her. Where Own Side politely asked to come in and sat genteelly, The Stand-In barges in and demanded attention – which I was happy to give it, as it currently stands as one of my favourite records of the year. So obviously I was going to be at The Garrison on Friday night to see her tour new record through town. And an efficient tour it was, with Andrew Combs doing double-duty as both Rose’s rhythm guitarist and opening act. Also hailing from Nashville – if the cowboy hat, denim shirt, and boots didn’t make that clear – Combs started out solo and then slowly enlisted the rest of Rose’s band to back up his voice, possessing the right balance of twang and rasp without sounding affected, and fill out a set of satisfying country-rock drawing from his debut Worried Man. If Combs can make the sort of leap that Rose did between his this album and his next, he could be one to watch. Warmed up from their opening set, all the band needed to kick off the main set was for Caitlin Rose step out from behind the merch table and take centre stage. A six-piece band might have seemed like a lot of musical overhead for a still-emerging artist playing small rooms, but there was no arguing with the results. Even though the songs on The Stand-In are strong enough to have been able to impress with a simpler presentation, it was wonderful to be able to hear all the lines and textures of the recordings rendered live and enhanced in parts – the four-part backing harmonies on “I Was Cruel” were unexpected and beautiful. And with such a high performance bar set by her band, Rose actually had trouble keeping up for the first portion of the show. Not in voice – she sounded great – but despite some warm and friendly banter she seemed somewhat detached onstage, often staring up at the ceiling when she stepped back from the mic; less leading her band than fading back into it. It didn’t feel like disinterest as much as a sort of shyness, which was surprising considering how brassily she comes across on record. Happily, this improved as the set progressed – helped out with a few drinks – and while she charming throughout the show, she was visibly more at ease by the end of the main set, comprised of a lot of The Stand-In, a healthy dollop of Own Side, and ceding the spotlight back to Andrew Combs for one of his own songs on which they duetted. “Everywhere I Go” would have been wonderful to hear, but probably didn’t fit the flow of the show. Following a solo reading of “Sinful Wishing Well”, she called the band back out for a raucous interpretation of Buck Owens’ “Tiger By The Tail” and Own Side highlight “Shanghai Cigarettes”. According to the set list, this should have been the end of the encore but Rose was called back by the audience and obliged with a real encore of an a capella ode to a Dave Edmunds t-shirt. A winning finale to a show that didn’t necessarily start slow, but certainly ended on all cylinders. The Singing Lamb and Panic Manual also have reviews of the show, and The Washington Examiner and Red Eye have interviews with Rose. With the 10th anniversary edition of Give Up out this week, Jimmy Tamborello of The Postal Service gives CBC Music the inside story on some of their most beloved songs and confesses to Exclaim that the new songs on the anniversary edition of the album aren’t Give Up outtakes but remnants of an aborted second album; he also talks about the record with The Irish Independent. The Postal Service are at The Air Canada Centre on June 11. Iron & Wine’s new album Ghost On Ghost is out next week and doing the advance stream thing at NPR. Sam Beam talks about the new album with The Hollywood Reporter. Noisey has got last week’s listening party/Q&A of the new Yeah Yeah Yeahs record Mosquito archived on their site; it’s presently the only place to hear the whole of the new record before its out April 16. The Sun and Spinner asked questions of Flaming Lips frontman Wayne Coyne, who also hosted a Reddit “Ask Me Anything” last week. Their new album The Terror is out next week on April 16 and streaming in whole at NPR. NPR has a World Cafe session and MTV Hive an interview with Jim James, who hits The Phoenix on April 24. Buzzfeed elicits some serious Morrissey hate from Bradford Cox by way of a Deerhunter interview. Their new album Monomania is out May 7. Drowned In Sound interviews Black Rebel Motorcycle Club, in town at The Kool Haus on May 9. Finally, the first official taste of the new National album Trouble Will Fine Me, out May 21. They headline Yonge-Dundas Square for NXNE on June 14. Spin has premiered another track from the new Saturday Looks Good To Me album One Kiss Ends It All, out May 21. Though the existence of Centro-Matic/New Year/Pedro The Lion supergroup Overseas was announced way back last Spring, the fruits of the Will Johnson-David Bazan-Kadane Brothers alchemy will finally be available to hear via their self-titled debut on June 13. Two songs are available to stream on their site, and it sounds exactly as you’d think a combination of those talents would – wonderful. The Skinny talks to Kurt Vile, who brings Wakin’ On A Pretty Daze to the Toronto Urban Roots Fest at Garrison Commons on July 7. Also playing TURF that day are Yo La Tengo, whose James McNew is interviewed at Loud & Quiet. Cat Power has released a new video from Sun. The Current has got a video session with Low. 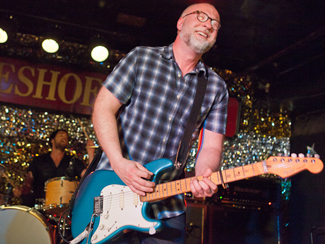 Frank YangUnderstand that I am in no way, shape, or form complaining, but I was pretty surprised when it was announced that Bob Mould would be playing The Horseshoe this past Friday night. Not that one legendary artist doesn’t deserve a legendary venue, but considering that his profile arguably higher than its been in years thanks to a 2012 that included the 20th anniversary Sugar reissues and tour, the publication of his memoirs, and his best-received new album in some time with Silver Age, to say nothing of the fact that he hadn’t played Toronto in almost half a decade, I thought he’d have been booked into a larger room. At least something on the scale of Lee’s or The Mod Club, where he played the last two times through including the last time I saw him here at home in Fall 2005. But no, it was to be The Horseshoe and so unsurprisingly it was sold out and jammed and primed to go off. Amidst the… older demographic that was gathered to see Mould celebrate his 30-plus year career, were a smattering of decidedly younger attendees who you could reasonably assume were here to see the opener. Minneapolis trio Now, Now – formerly Now, Now Every Children – have been through town a number of times, but usually attached to bills of a more pop-punk-emo persuasion. That’s why, despite having liked them for a few years, I’d only finally gotten to see them live at SXSW 2011 where I wouldn’t have to sit a half-dozen sets of tattoos and asymmetrical haircuts. Which is not to say that that’s not their natural scene – their thoughtful grunge-pop with downcast lyrics but delivered with big smiles is definitely of a genre – but thanks to Cacie Dalager’s terrifically emotive vocals and their sharp sense of melody, they’re also better than most of that genre and can definitely break to broader appeal. Their latest album Threads was both produced and released by Death Cab For Cutie’s Chris Walla, and his band’s path is one that, with a few lucky breaks and soundtrack placements, Now, Now could reasonably follow them down. Local fans might have felt disappointed that last year’s Copper Blue tour, wherein Mould, bassist Jason Narducy, and drummer Jon Wurster played the whole of 1992’s seminal Sugar debut in its entirety, didn’t come to town – I was lucky enough to catch one of those shows at SXSW 2012 – but if anyone thought that meant he wouldn’t continue to lean heavily on one of his most-loved records… well they’d have been dead wrong. Mould could have exulted in the roaring response from the audience as he took the stage – it’d have been well-earned – but instead he and his band got straight to work, tearing through side A of Copper Blue in sequence with brutal efficiency. This accomplished two things – it got the audience further worked up into a sweaty lather and got those songs out of the way. The next block of songs focused on Silver Age and confirmed that these compositions were, as many have pointed out, Mould’s most Sugar-like in years, their balance of melody and white noise existing quite comfortably alongside the older numbers. The new material also elicited more furious guitar soloing from Mould, perhaps him feeling these songs still had room to improvise whereas the Sugar songs were fixed for the ages. Silver Age properly serviced, Sugar material began creeping back into the set, first with a couple of unexpected songs from Beaster – I don’t know that I’ve ever heard any Beaster material live – and then “Your Favorite Thing” from the underrated File Under: Easy Listening. Finally, inevitably, it was time to reach into the Hüsker Dü songbook for “I Apologize” and “Chartered Trips” before wrapping back in the 21st century with Silver Age standout “Keep Believing”. The first encore contained the only non-Silver Age selection from his solo repertoire – “Egoverride” from his 1996 eponymous effort – and one more Copper Blue selection in “If I Can’t Change Your Mind”, while the second encore deviated from their regular set by inviting local music scribe Sam Sutherland onstage to lead a quick and furious cover of The Viletones’ “Screaming Fist” before closing for good with another trifecta of Hüsker songs. It was a pulverizing set start to finish – the 15 songs of the main set clocked in at under an hour – but with Mould’s glasses fogged and shirt soaked from the sweat and steam of the crowd and Narducy and Wurster somehow managing to match his energy joule for joule, there was no question they’d given their all. And it answered the question of why they played a smaller room than they probably could have – small space, huge pressure, massive explosion. Legendary. NOW and Backstage Rider also have reviews of the show and The Sydney Morning Herald an interview. Mould is back in the region on August 3 as part of The Grove Festival in Niagara-On-The-Lake. Caitlin Rose has marked the release this week of her new record The Stand-In with a new video, premiered over at Billboard. She plays The Garrison on April 5. Brooklyn’s The Men are the topic of conversations at Consequence Of Sound, The Village Voice, Spin, and Interview what with their new record New Moon coming out this week. The new Son Volt album Honky Tonk, out this week, is available to stream in whole over at American Songwriter. Blurt, The Wall Street Journal, Rolling Stone, and The Riverfront Times have feature pieces on the band. Ra Ra Riot have premiered a new video from their latest Beta Love. 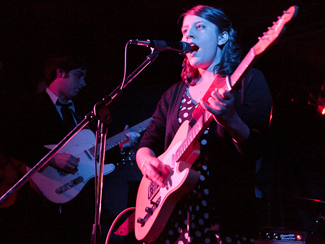 They play Lee’s Palace tonight – March 6 – and are back on June 8 as part of the Field Trip fest at Fort York. 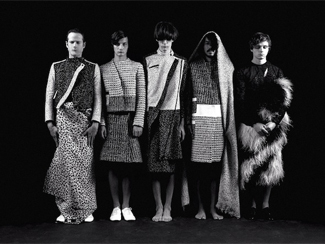 Drowned In Sound talks to Alan Sparkhawk of Low. They play The Great Hall on March 16 and The Invisible Way is out March 19. The Dumbing Of America has an interview with Black Rebel Motorcycle Club, who are prepping for the March 19 release of their new album Specter Af The Feast by giving away an EP for the first single from their website. They play The Kool Haus on May 9. Also at Dumbing Of America – an interview with Local Natives, who’re at The Phoenix on March 28. The Black Angels are streaming a new song off their forthcoming Indigo Meadow, out April 2, with some supporting words at Rolling Stone. 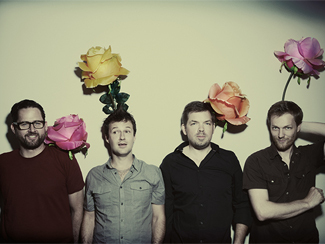 The new album brings them to The Danforth Music Hall on April 13. Even though The Flaming Lips have a new record in The Terror coming out April 2, Pitchfork wants to talk about their old albums, offering up a video oral history of The Soft Bulletin. Steve Earle has released the first video from his forthcoming album The Low Highway, due out April 16. CBC Music talks to The Thermals, whose have a bunch of reissues out this week and a new record in Desperate Ground out April 16. Billboard and Rolling Stone have features on Yeah Yeah Yeahs and their new record Mosquito, which comes out April 16. Exclaim and Men’s Journal has questions for Jim James. He is at The Phoenix on April 24. Saturday Looks Good To Me have announced details of their comeback album One Kiss Ends It All, out May 21, and made the first song from it available to stream. Consequence Of Sound has details on the 25th anniversary reissue of R.E.M.’s Green, which will come with the requisite remastering and second disc of period-correct live show. It’s out May 14. 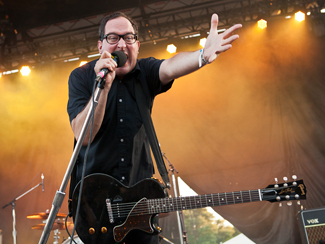 Entertainment Weekly reports The Hold Steady will contribute a new song to the soundtrack of the upcoming season of Game Of Thrones. The show premieres March 31 and they play the Toronto Urban Roots Fest at Fort York on July 4. NPR has a video session with Yo La Tengo, back in town at the Toronto Urban Roots Fest on July 7. Spinner interviews Ted Leo on the occasion of Hearts Of Oak‘s tenth anniversary.